There is nothing more nostalgic than the smell of parathas for me.I don’t need anything fancy but just my mothers plain parathas with some potato capsicum curry.This is my most favorite combination in the world.Am slightly embarrassed to say that my brother and I have had many a fight culminating with hair pulling for the last paratha. When on the Whole 30 program I don’t miss bread or rice as much as I miss the parathas.I tried making them with grated cauliflower and egg.It turned out to be pretty awful and eggy.Grilled eggplants come as close to paleo parathas for me till date. Here in india you get all shapes and sizes of eggplant.We call them baigan in hindi.Some of the most tasty vegetarian dishes are made with eggplant.We have adopted the Baba Ganoush and made it Baigan Bharta which is an almost staple in the north of india.We also fill the small ones with spices and grill it on the skillet. This dish is pretty simple in its preparation.Maximum amount of your work is in making the kheema for this dish. 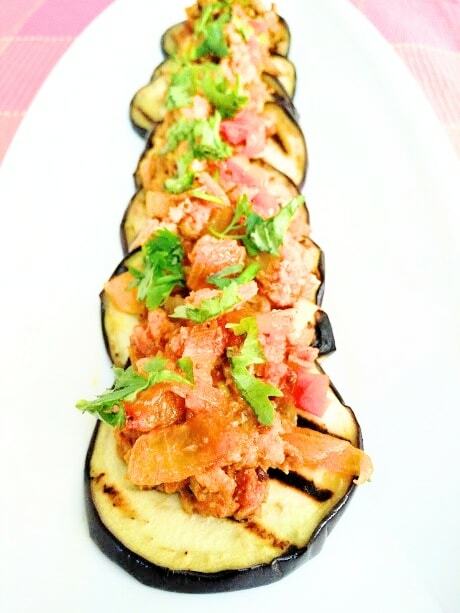 Paleo and Whole30 approved Chicken Kheema on Grilled Aubergine. Add the chopped onion and garlic.Saute till brown. Add the chilli,garam masala and turmeric.Roast for 30 seconds. Add the tomato and 2 tablespoon of water. Cook for 3-4 minutes till the tomato has started to disintegrate. Add the minced chicken and cook for 15-20 minutes. Cut the Aubergine in thin disks. Use a grill pan or a normal pan.Add the oil. Place aubergine on the pan.Cook on high heat for 1-2 minutes each side. Spoon the minced chicken on top of the grilled baigan.